As the New Year arrives it brings a season of change, from the change in the weather with progressively colder days, to our New Year’s resolutions which are always full of promise. Change is always in the air as the calendar moves ahead and that sentiment holds true in the world of coding as well. 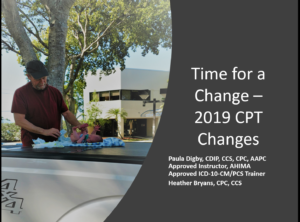 As the holiday season passes and the New Year starts we as coders can count on one thing – the new CPT code set and a variety of new, revised and deleted codes, as well as guidelines, instructions, and payment methodology. Join us as we take you through some of the biggest changes to the code set for 2019.